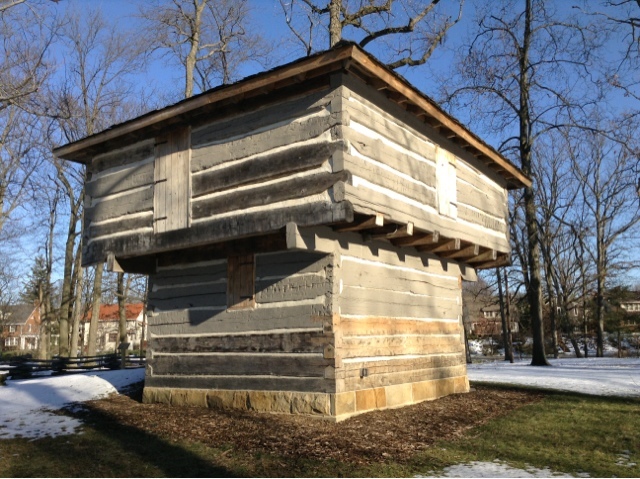 War of 1812 block houses in Mansfield (top) and Fort Meigs (bottom). From Practical Instructions for Military Officers: Comprehending a Concise System of Military Geometry, Field Fortification and Tactics of Riflemen and Light Infantry . Also the Scheme for Forming a Corps of a Partisan, and Carrying on the Petite Guerre ... to which is Annexed, a New Military Dictionary ... published 1811 by Epaphras Hoyt. NEXT to an acquaintance with the field exercises and duties of the camp, no part of military- science is of more importance to An officer than for fortification: for without some knowledge of this, how will he be capable of throwing up a work for the defense of a post, or detachment, entrusted to his command when he has not with him an engineer? A thousand instances of this kind will occur in the course of service 4 and an -officer would be extremely mortified, should he be compelled to surrender to an enemy, when a little acquaintance with fortification would have enabled him to construct a temporary redoubt, or other small work sufficient for his defense, till he could be relieved by his general. Another work with which a post may be fortified* and which affords a formidable defense against musketry, is a block-house. In new countries, where timber is plenty, these are constructed expeditiously. These houses are usually built two stories high; with hewed logs of sufficient thickness to resist musket shot ; the ends are locked together in the manner of the common log houses in new settlements,- and the upper story is made to project about three feet beyond the walls of the lower story. Loop-holes are made in the projection, to fire on the enemy without, and also in the floor of the upper story, to fire on him should he gain the lower apartment. Loop-holes are also made in the walls of both stories* to annoy the enemy in his approach these should be made 3 or 4 inches wide on the exterior, and 6 or 7 on the interior side ; the length up and down 15 inches, and four and an half feet from the floors, and sufficiently numerous for one half of the men to fire at once. These holes are sometimes made wide on the outside and narrow within, like an embrasure but it is evident, that the shot from the enemy will be much more likely to enter, by glancing on the tides of the aperture, than when the narrow side is outward. If the house is furnished with cannon, port-holes must be pierced in the walls,at the angles, sufficient to admit the muzzles of the guns. These, as well as the loop holes, may be stopped with billets of wood fitted to them, but in such a manner that they may be cleared for action without the least delay. The communication between the two apartments may be simply a ladder, pasting through a trap-door in the upper floor. The outer door should be musket proof, and so constructed that it may be firmly fastened on the inside. The building may be furnished with a chimney, and each room with a fire-place for cooking. When other materials cannot be procured, the chimney may be built with small sticks well covered with clay mortar. The roof may be composed of boards and mingles, or when these cannot be procured, bark from the trees in the vicinity may be substituted. A block-house, built in this manner, and well calked, to keep out the air, affords a comfortable- residence in cold weather. It surrounded with palisades, it will make a better defense. Fig. 55, plate 7, is a view of a block-house, the lower room furnished with cannon and port-holes at the angles. The background exhibits a view of a mountainous country, and a river passing near the house ; over the river is a bridge of boats, the house serving as a tete de pont. 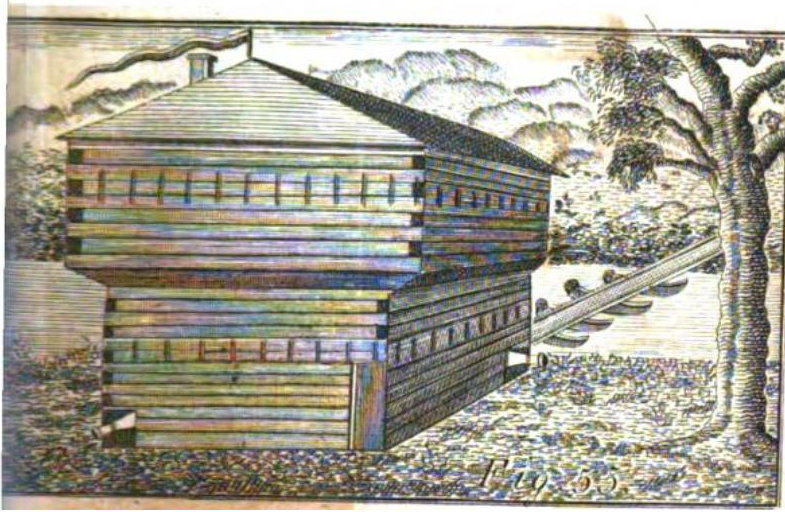 The blockhouse in Hoyt's manual.